A car that you and your family can enjoy desire and even is proud of owning it. Buying a pre owned car can better fulfill these since it offers a wide range of cars within your planned budget. For Example in a certain price range you can select from a Verna / Swift Dzire / Toyota innova/ Ikon and even a Honda City. Typically the life of new car engine is approximately 150,000 kms*, and in average running of car in Indian Scenario is approximately 12,000/- kms* per annum. So year of registration and mileage both defines the age of car. Choice of cars in the given budget is biggest value proposition for a customer. And when a Pre Owned Cars comes with the “Toyota U Trust” assurance and warranty similar to what is available at New cars to our esteemed customers. This also allows you to upgrade to bigger car to match your aspirations in your budget. Check weather all features are functional or not. At all over Stores across we are happy to take you through the complete demonstration and not only once but till you satisfy completely. Look for signs of an accident, such as dents or new paint or chrome. Make sure the hood shuts properly. Check the body for rust or fill. Look under the car. Check for cracks in the frame, rusting or welding. Check the condition of the muffler, tailpipe and exhaust components. Look for signs of fluids leaking from the car, including oil, brake or transmission fluid. Lift the hood and check the condition of the belts and hoses. Check the battery to see if it is cracked. Pull out the dipstick to see the oil level, and whether it's dirty. Check the parts and accessories, such as lights, horn, mirrors, seatbelts, radio, heater and windows. Make sure they all work. Have a friend check the outside lights for you. Make sure doors open and close easily, and that handles and locks work well. Check the dimmer switch, headlights and windshield washer. How do I contact someone at Toyota U Trust? To get an immediate answer to your question, start at your nearest Toyota U Trust Store. You can reach us by using Contact Form. Yes. In fact, we'll buy your car even if you don't buy one from us. We will carefully evaluate internal & external condition of your car as well will check related documents and afterwards we will give you best quote. And you are under no obligation to buy one of Toyota U Trust’s cars if you sell us yours. Can I get my car evaluated online? You must either bring your car to a Toyota U Trust store or get it evaluated free at your doorsteps to receive an evaluation. To determine your car's value, our evaluator will check the documents, inspect and test drive your car. When we’re done, we'll give you a quote, which will be valid for 7days. Do I need an appointment for an evaluation to check my car’s worth? For evaluation at our stores, no evaluation appointment is necessary. Just visit our nearest Toyota U Trust Store. For doorstep evaluations, you need to contact us and we will fix an appointment with you for free evaluation of your car. This process usually takes 15 to 20 minutes, and we'll give you the quote. First, we check the documents of the cars & then will go to the car to check the paint and body for signs of previous body repair and frame or flood damage. Paint and body for paint lines, overspray, body putty, dents and scratches. Frame damage will also affect your car's value. At Toyota U Trust, we don't resell frame-damaged vehicles to our customers. Then we check your car's interior, exterior, mileage, and age. Lastly, we test drive your car to determine its mechanical condition. Excessive mileage, ownership and wear and tear may lower your car's value and decrease its resale value. Will you explain how you evaluate my car? What if car is hypothecated with finance company & I owe more on my car than the amount of your offer? If car is hypothecated with finance company, it can’t be sold until full loan amount is paid back to said company. You need to collect Foreclosure Statement from finance company to know about the pay-off amount at the time of selling the car. Either you pay the pay-off amount or Toyota U Trust will pay on your behalf & balance amount of the car will be given to you against the delivery of the car along with relevant original documents. Also, Toyota U Trust will hold a small amount for the NOC, which will be given to you against the NOC issued from finance company. If your pay-off amount is more than the value of your car, we’ll calculate the difference between your pay-off and our offer to you. We'll accept a cash or demand draft in favour of finance company for the difference amount and then pay off your finance to the company for you. Please note that you might be asked to visit to finance company office along with our evaluator to close the loan as this is a requirement by financier. What happens to the cars Toyota U Trust buys? We’ll buy any car, each car must pass our evaluation process before we’ll consider it for our lot & will be sold at our stores. When we sell, we varify the status of the buyer & ensure that documentation for transfer is handled properly. Proof of transferred RC is kept in our record & can be sent to you for your reference on demand. Can I trade in my leased car? What are the steps involved in availing a loan? Who can avail Pre-owned Car Loans? What all documents are required for finance? This varies upon Model/Year of Manufacturing and at the financer’s discretion. Toyota U Trust will assist you for choosing a car which can be financed. How much finance amount can I avail on a car? How interest amount is calculated? Yes, all financial institutional use to charge “Processing Fee”, which varies from institution to institution. Loan processing is very quick now a day. Normally once the complete set of documents is submitted it will take approximately 72 hours for banks to process the payment. No, it is not must. But few financers also extend loan facility based on Guarantor. Loan is to be repaid with equal monthly installment (EMI’s) either through Post Dated Cheques (PDC’s) or through ECS facility if available. Can I foreclose my loan before completion of full tenure? Yes, but only after completion of first 6 months. Foreclosure fee varies from 3-6% of outstanding principal. Any security required against the loan? Tell me more about Toyota U Trust? What if I don’t have email address? Please sign-up for a free web-based email address that is easily available. Email will be an important mode of communication. What geographical area Toyota U Trust serve? You “Find a Store” section at our website. 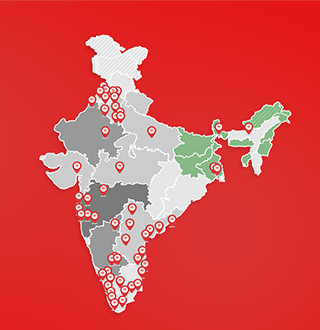 We are in a phase to strengthen our pan India network to serve you better.